The Trades Union Congress (TUC) is a national trade union centre, a federation of trade unions in England and Wales, representing the majority of trade unions. There are fifty affiliated unions, with a total of about 5.6 million members. The current General Secretary is Frances O'Grady. The TUC’s mission is to support trade unions to grow and thrive, and to stand up for everyone who works for a living. They campaign for more and better jobs, and a more equal, more prosperous country. The TUC archives are held at the Modern Records Centre at the University of Warwick Library. The archive contains files from c1920 – 2000 consisting of correspondence, internal and external documents, minutes, reports, printed material and press statements. Arising out of the 1897 Congress, a decision was taken to form a more centralised trade union structure that would enable a more militant approach to be taken to fighting the employer and even achieving the socialist transformation of society. The result was the General Federation of Trade Unions which was formed in 1899. For some years it was unclear which body (the GFTU or the TUC) would emerge as the national trade union centre for the UK and for a while both were recognised as such by different fraternal organisations in other countries. However, it was soon agreed among the major unions that the TUC should take the leading role and that this would be the central body of the organised Labour Movement in the UK. The GFTU continued in existence and remains to this day as a federation of (smaller, often craft-based) trade unions providing common services and facilities to its members (especially education and training services). The Scottish Trades Union Congress, which was formed in 1897, is a separate and autonomous organisation. The Parliamentary Committee grew slowly, confining itself to legal matters, and ignored industrial disputes. In 1916 Harry Gosling proposed that organised labour needed an administrative machine. Following the railway strike of 1919, Ernest Bevin and G. D. H. Cole proposed a new system. The Parliamentary Committee became the General Council, representing thirty groups of workers. The General Secretary of the Trades Union Congress became chief permanent officer of the TUC, and a major figure in the British trade union movement.The system was successfully implemented by Fred Bramley and Walter Citrine. By 1927 the TUC had the making of a trade union bureaucracy similar to the civil service. 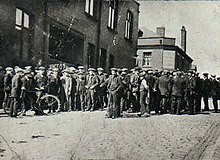 A TUC survey of local trades councils who were approached by unemployed marchers for support in 1936 shows widespread support for unemployed workers' protest marches among the local trade union activists. The TUC leadership subsequently tried to distort the result of the survey to justify its own opposition toward unauthorised marches. ^ a b "About the TUC". TUC. Retrieved 10 October 2016. ^ "TUC: Frances O'Grady is first female leader". BBC News. ^ Chris Coates, "Union History Online: Digitization Projects in the Trades Union Congress Library Collections." International Labor and Working-Class History 76.01 (2009): 54–59. ^ "Trades Union Congress". mrc-catalogue.warwick.ac.uk. Retrieved 10 October 2016. ^ Farrell, Sean (24 September 2016). "Sports Direct's surrender is just the start, says TUC". The Guardian. ISSN 0261-3077. Retrieved 10 October 2016. ^ "PRWeek UK Awards Winners 2016: Public Affairs | PR Week". www.prweek.com. Retrieved 19 October 2016. ^ a b c d "Trade Unions at Work: What they are and what they do" (PDF). TUC. Retrieved 10 October 2016. ^ "Agency Workers | workSMART". worksmart.org.uk. Retrieved 10 October 2016. ^ "TUC – History Online". unionhistory.info. Retrieved 12 June 2012. ^ "TUC – History Online". unionhistory.info. ^ Matthias Reiss, "Circulars, Surveys and Support: Trades Councils and the Marches of 1936," Labour History Review (2008) 73#1 pp 89–112.